Tomorrow is October already and in the blogging world that means one thing – time for another round of Write31Days. This year hosted by Crystal Stine. Last year was my first year and I joined in the 11th hour so my posts were not good. However, I have been planning and outlining this years posts since June. This series was inspired by the book Life Is A Verb, 37 Days To Wake Up, Be Mindful and Live by Patti Digh. The idea came to me in June but started taking shape in July. I am not a licensed grief counselor. My grief lessons came from the school of hard knocks starting in March 2008 when my husband Joe unexpectedly moved to heaven. Since then, I’ve had over 10,000 hours experience being a widow and learning to redefine and live a new life. I also attended the GriefShare program for one year and was asked to be a Co-facilitator in June 2009. For the next 5 years, (as my work schedule permitted) I mostly listened as God helped people mourning the loss of spouses, children, parents and other loved ones get through their grief. This Christ-centered, Biblically based program works. You will find the following items in each post. 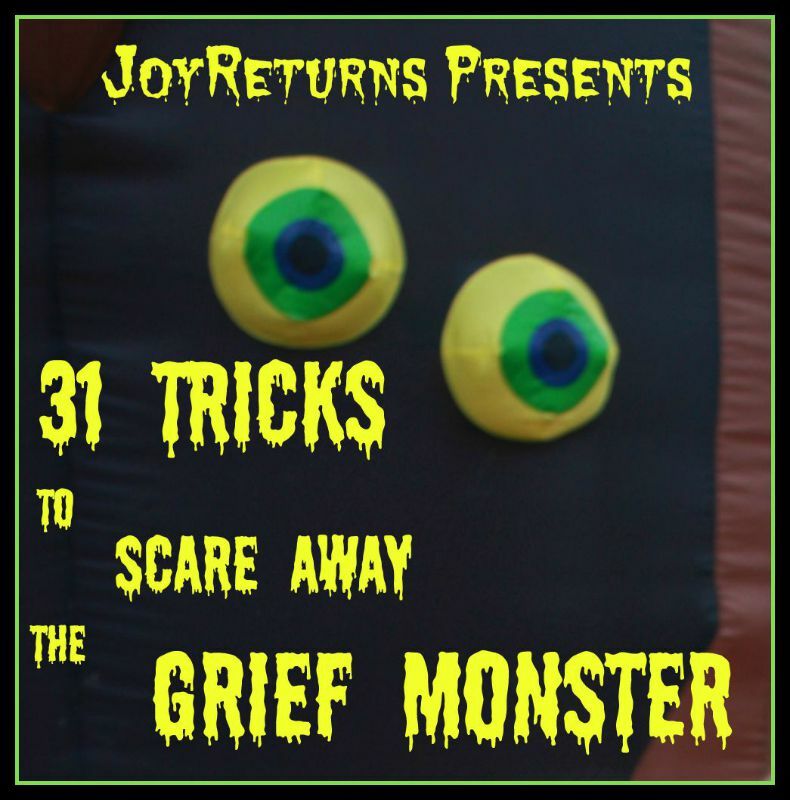 These “tricks” are easy and simple because that is what you need when grieving. They will require you to do something as doing is the best way to move forward through your grief journey. It is alright if you fall flat on your face while doing these “tricks” because falling on your face IS moving forward. You will also find a link to each post on my 31 Days page in case you miss a day. The links will be orange colored. There are well over 1,000 bloggers doing this challenge. I will share links to other blogs if I believe they will be of assistance to you. I welcome connection requests on LinkedIn, (personalized requests only) and Twitter. My email is Michele dot Kearns @ joyreturns.com (spelled out to avoid spammy emails). Not much sleeping will be going on in the Kearns’ household this October and I will not be the only sleep deprived blogger out there. So look out world! If you own a Dunkin Donuts, Starbucks, Panera or a local coffee house, my fellow bloggers and I will help you exceed your monthly sales goal. Personally, I also welcome suggestions for an excellent but affordable eye cream and concealer. Besides doing this series, I am in career transition and need to look good for my interviews.